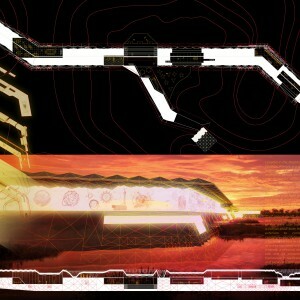 PARALLAX_FLEXURE | gURROO - A new generation of innovative minds. The displacement or difference in the apparent position of an object viewed along two different lines of sight. 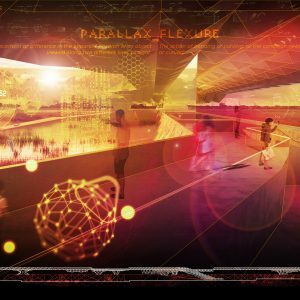 Located in the Montezuma’s Wetland Complex in Seneca Falls, NY, Parallax_Flexure is a gateway museum and a virtual reality pavilion engendered from the low-lying topography of the region and the ecological genius loci of this active site. Privy to one of the busiest bird migration routes on the Atlantic Flyway (hosting over 270 species of birds, reptiles and amphibians on the refuge), the museum flexes and bends to connect pedestrian paths over a body of water while simultaneously creating a syncretic moment in space that plays with light and where the exterior becomes the backdrop for a virtual world interface in the interior of the museums’ halls. 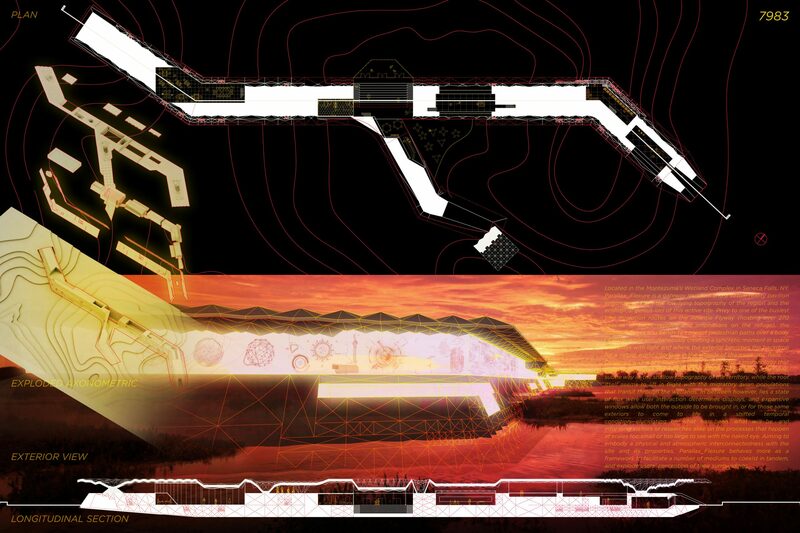 Designed with a grasshopper script to generate a morphology that collects rainwater, the museum rises from the ground in the same, subtle way as the shallow topography of the territory, while the roof itself seems to lift in flight with the migratory avian populations that transit through the wetlands. In between however, lies a state of flux were user interaction determines displays, and expansive windows allow both the outside to be brought in, or for those same exteriors to come to life in a shifted temporal condition—elucidating on what has been, what will be, and informing visitors or researches alike on the processes that happen at scales too small or too large to see with the naked eye. 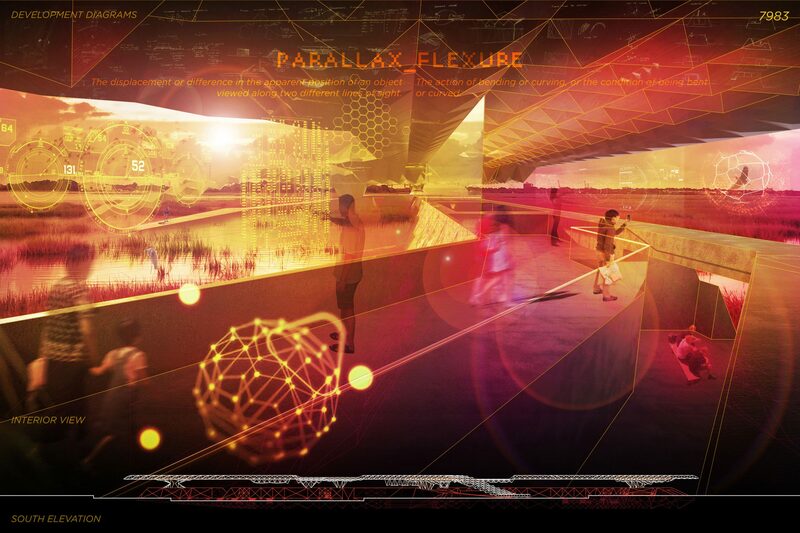 Aiming to embody a physical and atmospheric interconnectedness with the site and its properties, Parallax_Flexure behaves more as a framework to facilitate a number of mediums to coexist in tandem, and explode users’ perception of their surroundings.